Salvia miniata is an excellent hummingbird plant. Salvia mexicana 'Limelight' has chartreuse and blue flowers. We are displaying some of these in the Tropical Flower Garden. With about 1,000 species, hybrids and cultivars, the genus Salvia is sure to have something for every garden. Salvia is a member of the mint family, Lamiaceae, and many salvias have aromatic foliage, ideal for a scented garden. Salvia officinalis, common sage, and S. fruticosa, Greek sage, should have a place in every kitchen garden. The nutritious seeds of chia, S. hispanica, were a staple food of Aztec people. More frivolously, chia's mucilaginous seeds are popular for growing on the surface of terra cotta figurines in windowsill gardens. There are dozens of ornamental species of Salvia, both annuals and perennials, and many of these are rich nectar sources for insects and hummingbirds. Of course, not every species of Salvia is garden worthy, and some species are not adapted to South Florida conditions. There are, however, several that perform well in our area and have a bright — and colorful — future in our gardens. As a bedding annual, Salvia splendens has been popular for many decades. It is available in colors ranging including coral, white, purple, and the most common, a bright, eye-popping red. 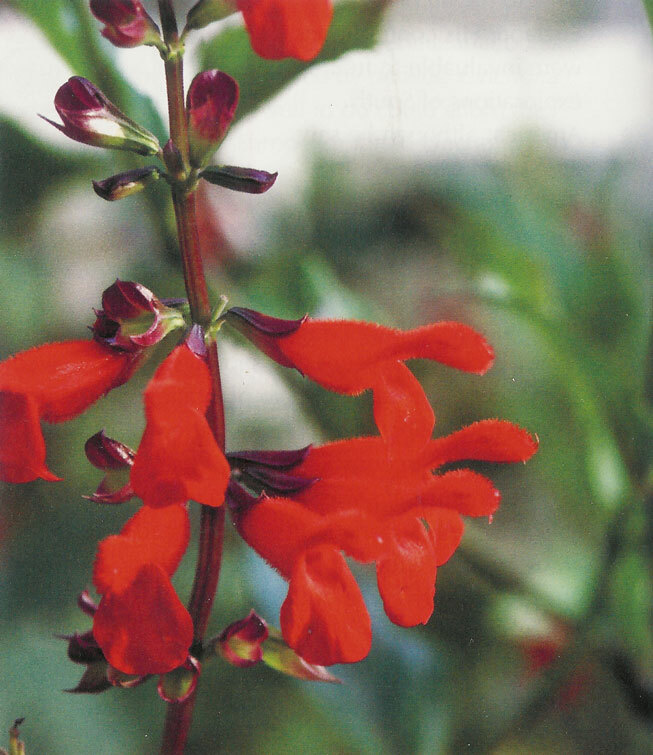 Salvia splendens is grown as an annual, readily available at most nurseries in the spring, and the compact plants will bloom reliably all season. They require a steady of supply of moisture (usually our summer rains are sufficient) and the removal of spent flower stalks. Unfortunately, as is the case with many highly inbred and modified cultivars, they offer litt)e in the way of nectar. Wildlife soon learns to regard the showy flowers as little more than false advertising. Two of the finest hummingbird attractants in my garden are Salvia miniata and S. mexicana. Both are perennial shrubs that can be pruned and kept within a manageable height of three or four feet tall. Salvia miniata forms a dense shrub with many stems, whereas S. mexicana tends to keep just one or a few main stems that become woody at the base. 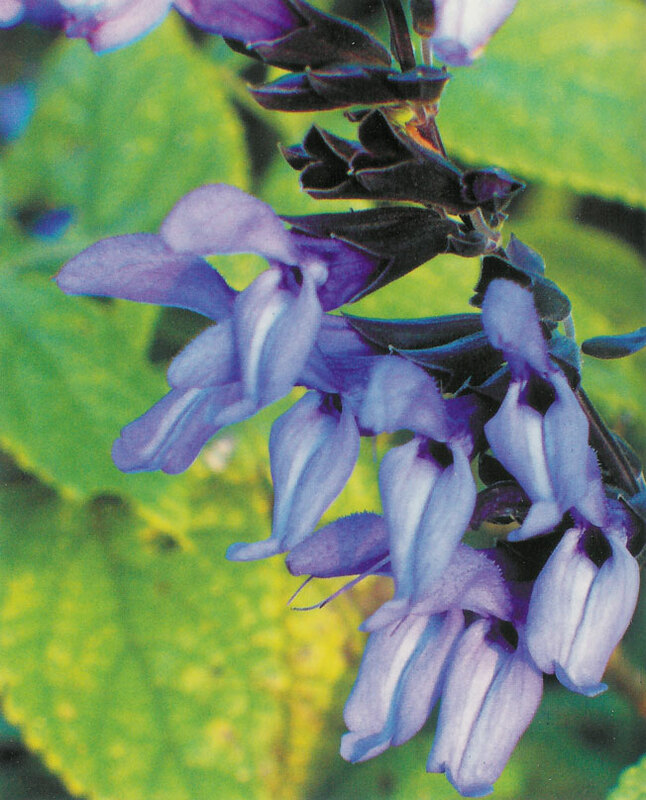 Salvia mexicana is available as several different cultivars, which differ from one another in the colors of the leaves, corolla, (the fused petals of the flower) and calyx (the cup formed by fused sepals that enclose the corolla). Salvia mexicana 'Limelight' has bright chartreuse calyces ard dark blue flowers. The flower clusters are large and striking, but the shrub is a bit leggy. A better cultivar is S. mexicana 'Compton's Pride,' which has dark, lustrous leaves and dark, velvety purple flowers nestled in greenish black calyces. It flowers once in mid-winter, and if cut back, again in late spring. Pruning this Salvia prevents the brittle branches from growing too long and breaking. Although most books will tell you that hummingbirds are attracted to red flowers, hummingbirds are smart enough to take advantage of the nectar in Salvia mexicana. It is one of their favorite plants. It also attracts butterflies. 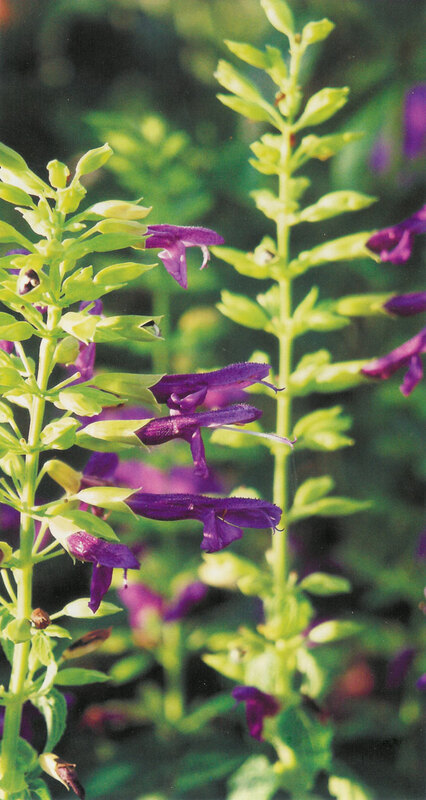 Salvia mexicana is best renewed every two or three years by propagating new plants from cuttings. Salvia miniata grows well in very light shade or an eastern exposure. It will tolerate fu11 sun if enough moisture is continually present. The corollas are fuzzy and the brightest scarlet imaginable; the calyces are green tinged with dark red. It never makes a mass of flowers, but according to my records my own plant has had flowers on it continually for over 30 months. This plant is a favorite nectar p1ant of the huummingbirds, but I have also seen sulphur and monarch butterflies feeding on the nectar. Last March, I witnessed a painted bunting feeding on the seeds from this Salvia. It was the first time I had seen this bird species in my garden. Any plant that attracts hummingbirds and painted buntings to my garden gets my vote! Another good Salvia is S. guaranitica 'Black and Blue'. There are some specialists who believe this is not a cultivar, but a hybrid between S. guaranitica and some other species. Either way, it is a handsome perennial species that grows well in our climate. It grows about two feet tall, but it spreads by underground rhizomes and tuberous roots. It has 1ight green foliage, blue-black calyces and indigo blue corollas. Hummingbirds will visit the flowers and drink the nectar. It too is a brittle shrub, but as with most Salvias, broken branches can easily be rooted to give new plants. 'Black and Blue' can show signs of nutrient deficiencies in our alkaline soils, but applications of acid fertilizer keep this species happy. Salvia offers color and so much more to our gardens, and we have only just begun to tap their horticultural potential. The yellow-flowered S. madrensis and the purple and white S. leucantha both received high marks in a trial at the Mounts Botanical Garden in West Palm Beach. The native S. coccinea flowers prolifically in the Lisa D. Anness Butterfly Garden. Many more species await introduction into horticulture. Mexico and Central America are home to dozens of attractive, untested species, and we have yet to tap the potential of the many Caribbean species. Plant breeders could unlock even more diversity and versatility, so the future for Salvia is bright indeed.